The danger and hilarity are non-stop in this glittering, farcical mystery. 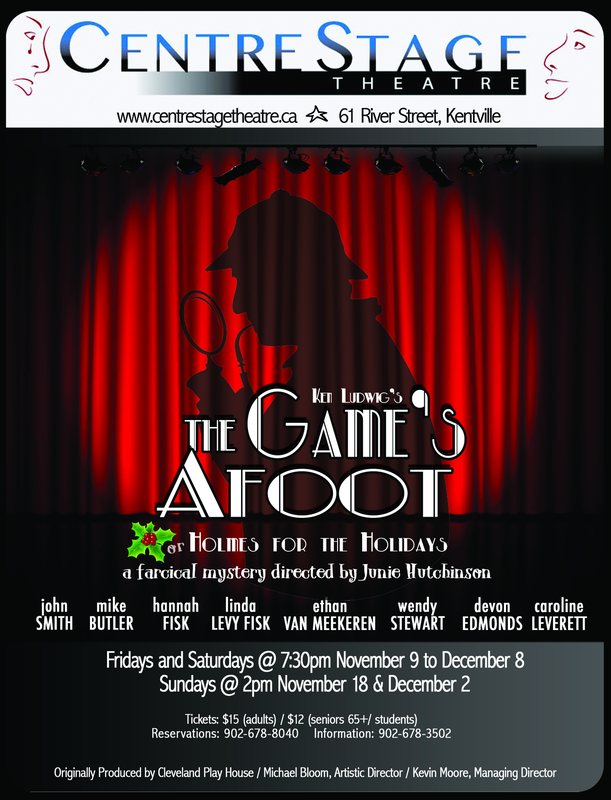 Ken Ludwig's The Game’s Afoot; or Holmes for the Holidays will be on stage at CentreStage Theatre in time for the holidays. It is December 1936, and Broadway star William Gillette, admired the world over for his leading role in the play Sherlock Holmes, has invited his fellow cast members to his Connecticut mansion for a weekend of revelry. When one of the guests turns up dead, the festivities in this isolated house of hidden rooms and state-of-the art gadgets quickly turn dangerous. Gillette assumes the persona of his beloved Holmes to track down the killer before the next victim appears. 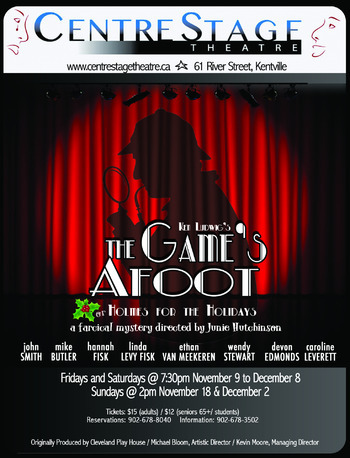 This play will keep you laughing and trying to figure out whodunit until the final bow. The play is directed by Junie Hutchinson. The cast in order of appearance: John Smith, Mike Butler, Hannah Fisk, Linda Levy Fisk, Ethan Van Meekeren, Wendy Stewart, Devon Edmonds, Caroline Leverett. The featured artist is Karen Kerr. Admission (cash or cheque): adults $15; seniors/students $12; children, age 12 and under, $5. Call 678-8040 (24/7) to reserve your seat. Reservations are held until 15 minutes before showtime.